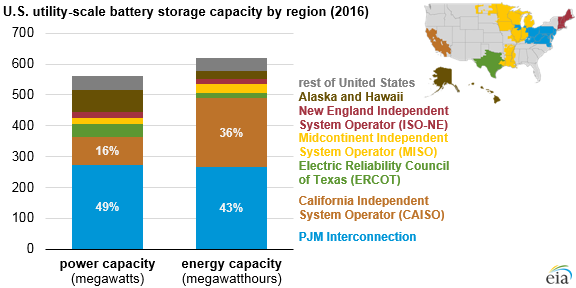 About two-thirds of utility-scale battery storage power capacity installed in 2016 in the United States is located in two electricity markets: the California Independent System Operator (CAISO), which covers much of California, and the PJM Interconnection, which covers all or parts of 13 eastern states and the District of Columbia. Utility-scale battery systems have been installed in these markets for different reasons. Utility-scale battery storage systems in California tend to serve energy-oriented applications, with smaller power capacities but longer discharge durations. Conversely, systems in PJM tend to serve power-oriented applications, with larger power capacities but shorter discharge durations. Unlike most electricity generators, which can be characterized by their power capacity, batteries are characterized by two metrics: power capacity and energy capacity. Power capacity, measured in megawatts (MW), is the maximum instantaneous amount of power that can be produced on a continuous basis. Energy capacity, measured in megawatthours (MWh), is the total amount of energy that can be stored or discharged by the battery. 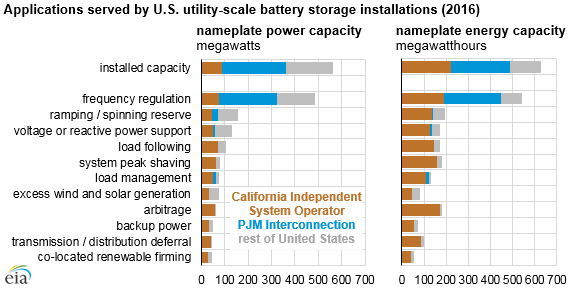 The PJM Interconnection currently has the most utility-scale battery storage capacity in both power and energy terms. In 2012, PJM’s ancillary services market introduced a frequency regulation product designed to compensate generation resources that can quickly adjust power output but are limited by the time they can sustain that output. Since then, utility-scale battery storage capacity in PJM has increased from 38 MW in 2012 to 274 MW in 2016. More than 90% of this region’s installed battery capacity assists with frequency regulation, which helps maintain the grid’s electric frequency on a second-to-second basis. Utility-scale battery storage installations in PJM tend to have relatively large power capacities, averaging 12 MW, and short discharge durations, averaging 45 minutes. As PJM introduced battery use into its market system, PJM experienced operational issues in its frequency regulation market. Battery storage systems could not sustain output through the daily periods when electricity demand quickly increases. During these periods, battery systems were quickly switching to charging mode, accelerating the increase in electricity demand. To address this issue, PJM changed its regulation signals in January 2017. However, following these new signals requires battery systems to charge and discharge twice as often, which shortens their expected lifetime. PJM’s changes to its regulation signals are the subject of pending complaints filed with the Federal Energy Regulatory Commission (FERC) by the Energy Storage Association and two storage project developers. FERC is the federal agency regulating the interstate transmission and wholesale sale of electricity. In 2013, the California Public Utilities Commission (CPUC) set an energy storage mandate requiring the state’s regulated utilities to procure 1,325 MW of energy storage capacity by 2020. By the end of 2016, California had 120 MW of utility-scale battery storage capacity in place. More than half of this capacity was procured by Southern California Edison and installed in December 2016. CPUC fast-tracked the approval of these installations to help address electricity reliability risks that resulted from constraints on natural gas supply following a leak at a major natural gas storage facility in Southern California. Another 42 MW of utility-scale battery storage capacity was installed in California in 2017, based on preliminary electric generator data reported to EIA. CPUC requires generation resources to provide at least four hours of output to contribute to reliability requirements. As a result, utility-scale battery storage installations in California tend to have small power capacities, averaging 5.7 MW, and long discharge durations, averaging slightly less than 4 hours. Installations in California also tend to serve a wider array of applications than those in PJM because many have been procured by regulated utilities to serve multiple applications without necessarily being directly compensated for each application through CAISO market mechanisms. Note: Several battery systems provide more than one application. Utility-scale battery storage capacity in other regions has not reached the levels observed in PJM and California, but actions by state and federal regulators may drive future deployment in other regions. For example, Oregon, Massachusetts, and New York have also issued storage mandates or targets. At the federal level, FERC issued a ruling on February 15 requiring organized wholesale markets to remove barriers to the participation of electric storage resources in the capacity, energy, and ancillary services markets.